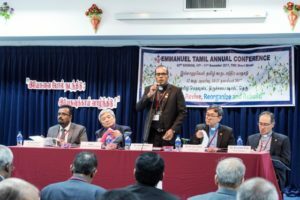 On 10 and 11 Nov 2017, Emmanuel Tamil Annual Conference (ETAC) met at Tamil Methodist Church (TMC) on Short Street for its 42nd Session – an annual gathering of clergy and lay representatives of its various churches, to recount and evaluate initiatives and their own ministries in the current year, and to plan for the year ahead. 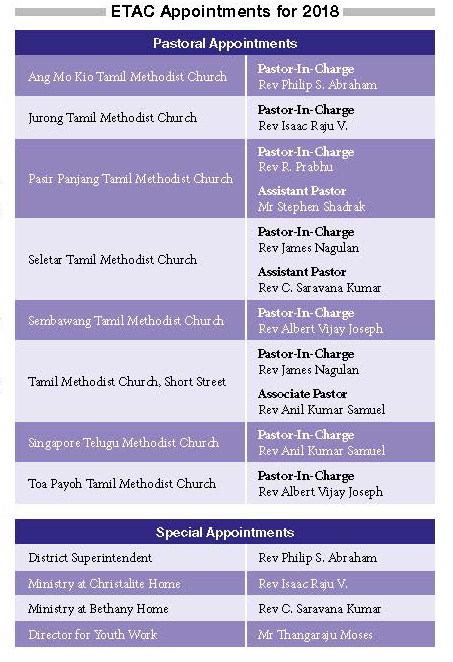 The Session kicked off with an Opening Service that introduced ‘Emmanuel Thuthi’ (Thuthi means ‘Praise’ in Tamil) – a 29-member choir handpicked from ETAC’s eight Tamil churches (see below for full member list). 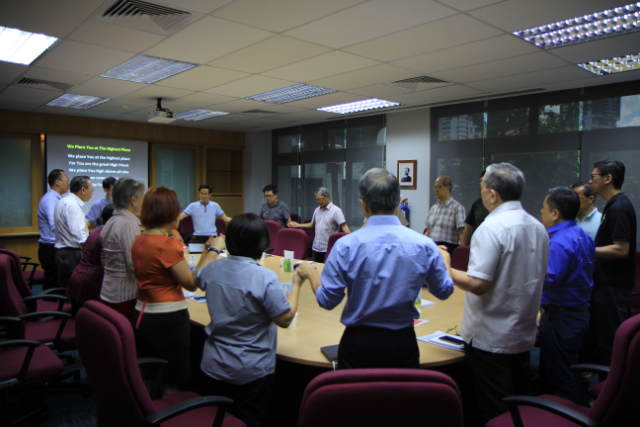 The group, last seen singing during Bishop Dr Chong Chin Chung’s Consecration Service, was formally inducted as ETAC’s official worship group. 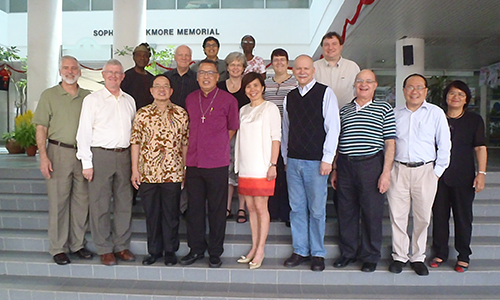 Each member received a specially-made badge, personally presented by Bishop Dr Chong. ‘Emmanuel Thuthi’ then led the musical worship section of the service, with the exuberance and flamboyance that is the hallmark of ETAC and its congregation. Delivering his first Review as President of ETAC in the 11th Quadrennium, the Rev James Nagulan (above, chairing the session) sounded the call for ETAC churches to “Renew, Revive, Reorganise, and Rebuild” – which is also the theme of the current Quadrennium for ETAC. Even as he painted a picture of hope and God’s providence over the past year, the President nevertheless exhorted the leadership and laity of ETAC to work together in several issues challenging the growth of the Tamil churches, and called all workers to combat these issues together, in a spirit of unity. 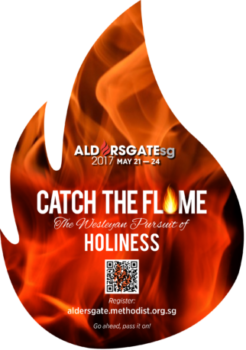 The challenges ranged from maintaining church membership to church attendance, tithing, and expansion. 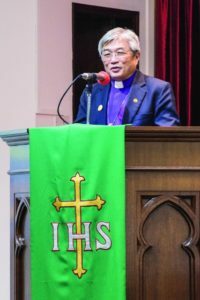 The Rev Nagulan urged pastoral leaders to set aside all baggage, to humble themselves, and to seek the Lord in matters that were truly of import to building God’s Kingdom. He reiterated the need to have strategic planning and thinking in moving ETAC forward, and not to rely on past glories and victories, or practices that might have worked well in the past but are now obsolete. The Rev Nagulan continued by highlighting two different schools of thought when it comes to “enlarging our tents”. The first focused on planting more new churches and increasing the number of churches within ETAC, while the other championed consolidating churches into specific geographical locations, so as to have access to a better pool of resources. As he delivered a realistic picture of the ground situations faced by both the outreach ministries in Ang Mo Kio and Pasir Panjang – that they have not seen significant growth over the years – the President surmised that expanding without a robust strategic vision and relying on the current model of having eight churches might not be viable and sustainable, due to various reasons. 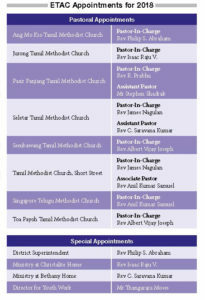 These included the facts that the ministries in Ang Mo Kio, Pasir Panjang, and even the Bedok Preaching Point largely served a transient community, changing the dynamics of the church whenever they leave the country; the lack of suitable locations to establish a place of worship; and low membership. 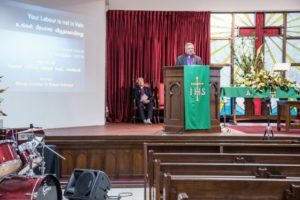 Most importantly, there is a dearth of ministers and pastors who are able to efficiently serve these congregations due to limited manpower, and as a result, they find themselves having to shuttle between churches, rendering their ministries less effective. “We already face difficulties in identifying leaders for the existing churches. 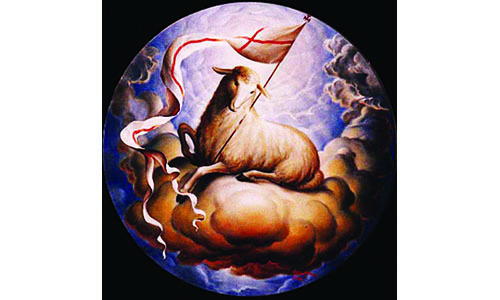 [If we further stretch] these leaders, they either [become] ineffective or soon move out from the main church and give themselves to new endeavours, weakening the ministry in the main church,” warned the Rev Nagulan, who also highlighted the strains faced by lay leaders who have to divide their time between work, serving the congregation, and their own families. “With the current situation of the Conference, we need to make some tough decisions if we really want to grow… The current churches may have to be moved to strategic locations, making our presence [more] accessible… Perhaps [even] seven churches is more than what we can manage. We have to work towards having one pastor to a church,” urged the President. 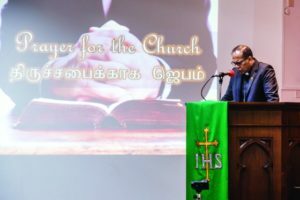 With one eye on local church dynamics, the Rev Nagulan also kept an eye on the larger role that ETAC has to play in Singapore society – particularly amongst the Indian communities both local and foreign. The Rev Nagulan spoke of SEVA – a collaborative ministry between ETAC and the Methodist Welfare Services (MWS) to reach out and engage with Indian migrant workers that they might experience the love of Christ and also have their homesickness alleviated – as a prime example of ETAC contributing to being a blessing to others. However, he also noted that SEVA is still in its infancy, and urged that more support be given to this valuable and important ministry. 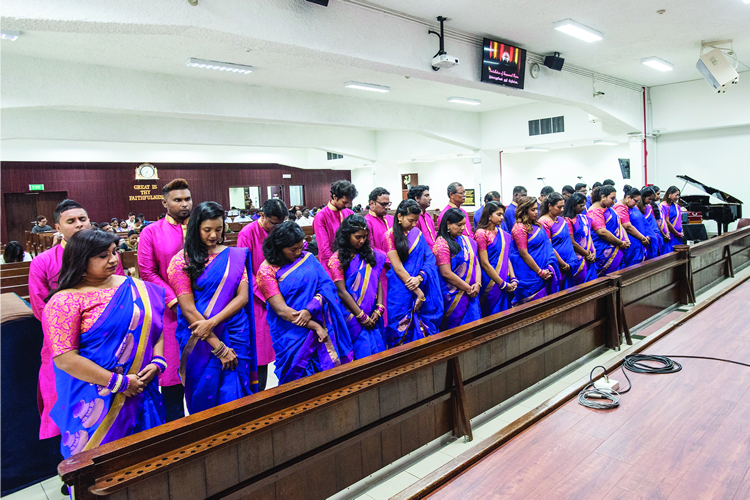 Additionally, he highlighted that more can be done to further equip pastors and church members, such as having them undergo training to be counsellors for the general community, and not just Tamil-speaking believers. “Many non-Christians have requested for solemnisation of their weddings, and are willing to attend marriage preparation classes. 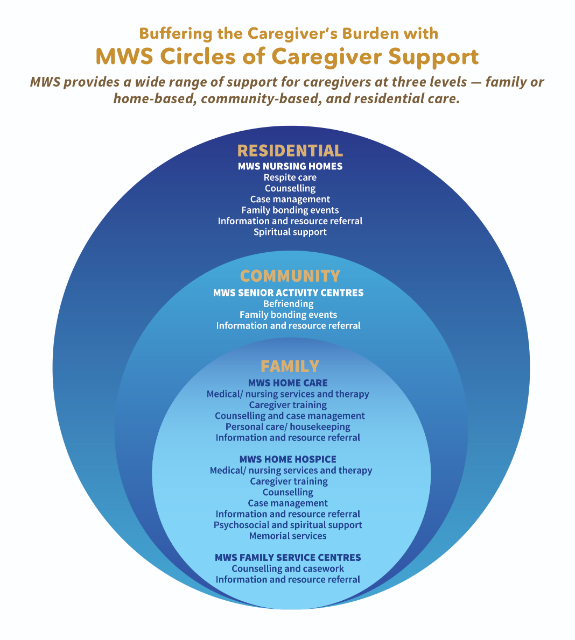 Family-life counselling is another idea where we can provide support to the community. The MWS has made available the Family Development Programme which gives us another opportunity to reach out to the larger Indian community,” said the Rev Nagulan. In conclusion, the President re-emphasised the importance of having and keeping the spirit of unity within the Annual Conference, and encouraged both clergy and laity to be aligned as they stepped into the year ahead. The two-day Session was rounded off with a Closing Service that doubled as a Memorial Service, where the congregation remembered the work and contributions of the late Rev Dr J. Daniel, a long-time ETAC pastor who served as President from 1984 to 1988, and passed away on 2 July 2017. (See MM Sep 2017 P17 for an article in his memory.) The Rev Nagulan and Bishop Emeritus Dr Robert Solomon gave a eulogy and a sermon respectively, touching on the servant heart and simple faith that the late Rev Dr Daniel possessed. In honour of the late Rev Dr Daniel, his wife Mary was presented with a cash gift, and a specially-prepared book containing various testimonials from church members and staff who had been in contact with him. is Methodist Message’s Editorial Executive. When not working on the latest articles, he enjoys long jogs and cuddling up with his three cats along with a good book.